Doulos Partners is a 501 (c) (3) organization and your donations are 100% tax deductible. Our Board of Directors fully funds the administrative costs of the ministry, which means that ALL of your donations go directly to the field. There are a few different ways that you can donate to Doulos Partners. See the options below to find which one fits your giving pattern best! Through PayPal, you can use a credit or debit card to give a one time or recurring monthly gift. Click the “Give Now” button below to be redirected to the secure PayPal site to make your gift. Many of our donors utilize the bill pay feature of their online banking to send monthly checks to Doulos. This is a simple way to donate and has absolutely no fees attached to the donor or to the ministry. If you have questions about using this option, call Josh Clarke at 205.313.3048. Use the link below to have a percentage of your purchases on Amazon donated to Doulos Partners! Just click on the link, shop and Amazon will send a check to us- it really is that easy! Through our partnership with National Christian Foundation, we are set up to take your donation of stock, real estate, personal property or estate gifts. Please contact David Johnson at 205.314.3135 to set up a time to discuss these options for your giving. We are members of the Evangelical Council for Financial Accountability. 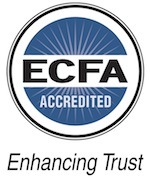 The ECFA is the premiere financial accountability company for 501 (c) (3) Non Profit organizations that provides accreditation to leading Christian ministries. It monitors financial integrity, fundraising practices, and board governance. Take a minute to learn more about Doulos Partners, a nonprofit in Birmingham with a focus on church planting, international missions, and spreading the Gospel. Read Our Story to learn about our vision, history, and beliefs.